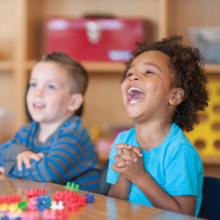 Tigers Childcare provides high quality early education and care for children age 4 months to 13 years. We understand the importance of these early years in a child’s life. We provide high quality environments, interactions and experiences that help each child reach their own potential. Your child’s entry into our programme marks a wonderful journey for both you and your child. Although this may be your child’s first experience of group learning, we see each child as an individual and their journey as unique. We employ passionate childcare professionals. Our internal training programmes mean our learning is dynamic and evolving continually. Our practitioners use the child themselves as the lead in all learning. A programme is built around each child’s unique needs to provide a stimulating, safe, and nurturing environment. We see each child as unique, and their learning path as individual. Choosing childcare is an incredibly important decision in a child’s life. It has long been established that the early years have a long lasting effect on a person’s life. With 90% of brain development taking place within the first five years of life, these years shape us into the people we will become. Tigers Childcare uses this knowledge and the teaching of developmental theorists to design a child-lead dynamic programme of learning. Our purpose-built Early Years Centres offer flexible full day care for children aged 4 months to 5 years. 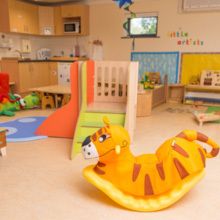 Tigers Early Years Centre operates a play-based curriculum model, which sits within the national curriculum framework of Aistear. Our environments are designed into areas of interest where the children can learn and explore. All learning is child-lead and planning comes from staff observations and each child’s emerging interests. The curriculum is extremely individualised meaning that every child has the ability to be an individual and to develop at their own pace. We make learning fun and memorable. Children are encouraged to have opinions and to question and participate. We use hands-on materials for all learning. Each child is allocated a key worker who is responsible for that child’s developmental path. Parents receive daily updates and monthly learning stories on their child’s progress and a plan for the path ahead. The curriculum is individualized meaning it changes depending on the children in our care. We see our children as participants in their learning. We see them as bright, intelligent and valuable. It has long been established that good quality learning experiences in the early years can have a huge impact on a child’s future learning. Early intervention and scaffolding of a child’s learning is the key to optimal development during these key years. At Tigers Pre-school we provide children with a top quality educational experience that eases their transition to primary education. We see children as active learners by allowing them choice and a role in their learning and we strive to develop confident learners. 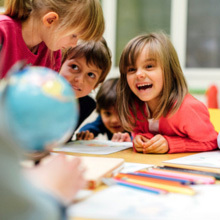 A number of our managers hold a degree in early childhood education. This level of educations means that curriculum is drawn up with a great understanding of child development theory. All of our pre-school assistants are fully trained and hold a relevant childcare qualification (FETAC level 5 or above). All of our staff are Garda vetted before starting employment at Tigers Childcare. We employ fully qualified special needs assistants when needed. We use the principles of Siolta as a quality assurance document in the running of our pre-schools. Each pre-school has weekly quality checks from senior management. These checks are documented and used to maintain a high quality of service across all levels. Our pre-school curriculum is based around Aistear. Aistear is the national framework for early years education. Our rooms are broken into learning stations. These stations allow children a choice in their learning. 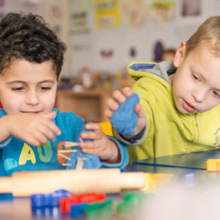 Using a key worker system we observe each child’s development over time, and individual plans are made to scaffold each child’s learning experience. Each month has a main theme and each week is broken into a number of learning goals. At the end of each month each child’s progress is assessed. Our curriculum changes depending on the children’s needs. We are lead in learning by the children in our care. A day in Tigers Pre-School allows children to experience learning through play. We believe that children of pre-school age learn best through play and hands-on experience. It is in their play that children make sense of the world. Staff follow a timetable to allow for structure during the day. However, the timetable is flexible and allows for the child-centred practice of following a child’s emerging interests. 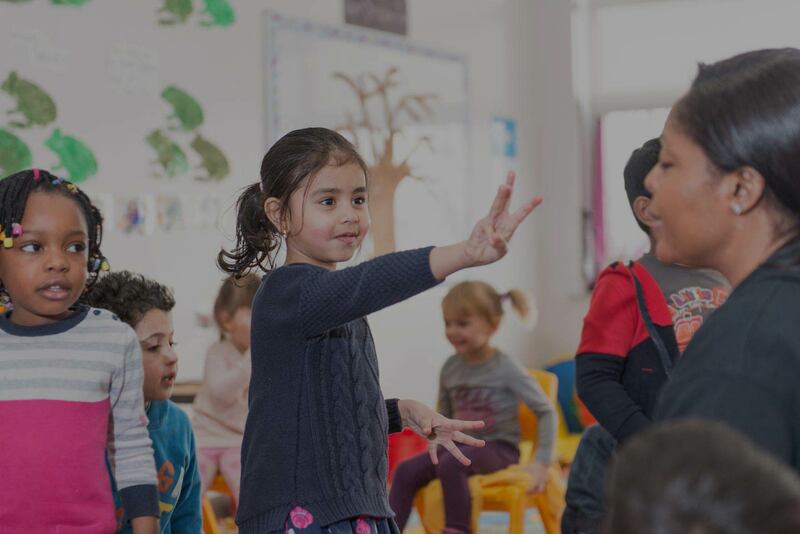 The curriculum pays particular attention to areas of language development, pre-reading skills, early maths, language and skills, and social and emotional development. We foster the belief that parents are the primary educators of their children and thus we have an open door policy in our pre-school. We have a parent school day rota which affords each parent the opportunity to attend school with their child during the year. We follow all current pre-school regulations and legislation with regard to childcare and child protection. We are members of the Early Childcare Ireland and have a close working relationship with County Childcare Committees and Barnardos. These services offer our staff support in best practice and training throughout the year. Tigers Pre-schools are inspected annually by the Tusla. To date our inspection outcomes have been of an extremely high standard. We are compliant on all fronts. At Tigers After School Care we provide school-age children on site in primary schools and community centers in the greater Dublin region. Listed below is the general routine at Tigers. This is a guideline and may change. We believe that after a long day in school children need to enjoy unstructured play in an environment with their peers where their social and emotional needs are met. The list below is a guide but children in afterschool very much design their own day. There is a mix of planned and child initiated activities throughout the day. Children are brought to the Tigers room and given a snack. 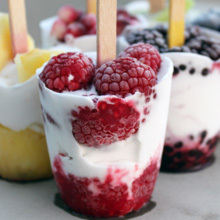 The snack will consist of a drink, fruit, yoghurts, crackers, cheese etc. On special occasions treats will be provided. The children will then be allowed 45 minutes of free play time. Below is an example of the activities that are planned for the children in Hour Club – please note that the activities are subject to change. Children can choose to play in small groups with any of the toys provided as well computers. Children may also decide to do art and craft or to initiate their own play in this time. In fine weather children will be allowed supervised play outside. Homework Club is an opportunity for children to do their homework in a quiet school environment. Children will sit by themselves and have their homework journals are out so that homework can be checked by a supervisor. Children are encouraged to do all written tasks first. Each exercise will be checked by a supervisor before a child starts on the next exercise. When a supervisor is happy that a child is worked on an exercise to the best of their ability their journal will be ticked and initialled. Learning homework (spellings, tables etc) will be checked once all written work is completed. Children will be checked on this work daily. Reading homework must be completed at home. We believe that this type of homework should be done with a child’s parent on a one to one basis. Each child must have a parent check and sign their homework journal daily. It is up to each parent to take responsibility for their child’s homework and make sure that all work is done to the best of their child’s ability. Homework Club is one hour of supervised homework time. If your child’s homework is not finished in this time they must go on to complete it at home. Parents can opt out of homework time if wanted. Junior and Senior infant children as well as children not taking part in Homework Club will be given this opportunity to wind down and relax after their day. Children are given this opportunity to have some one on one time with their care givers. This time is used for art and crafts activities or free play – the children decide which they would prefer. Younger children may wish to use this time as an opportunity to take a nap. Nap mats will be provided for any child who wants one during this time. The importance of physical activity for children cannot be stressed enough these days. Tigers recognise this fact and will use this time so children can partake in some form of exercise. We use the sports hall when it’s available to us and in fine weather the children are brought outside. Children will be encouraged to take part in movement games. From time to time outside groups will be brought into Tigers in order to give children at Tigers access to some professional coaching. These classes are non-compulsory and will run at an extra cost to the parents. All outside coaches will be supervised by a staff member. Hot meals are provided by our catering service ‘Moon and Spoon’. These meals are made specifically for children and contain no artificial ingredients. All dietary requirements are catered for but need to be specified in advance. A mix of weekly themes and children’s choice takes place during this time. Children’s interest are tracked and these interests are brought into themes. The children are encouraged to become involved in group opportunities, however every child is allowed choice and freedom in their day. The Early Years, Pre-School and After School Curricula are developed to individually suit each age group. 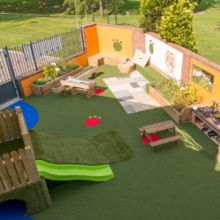 Our unique early years environments are built around the children’s developmental needs. The rooms should be fun and engaging and will change throughout the year. The rooms belong to the children in our care and so you will see many links to each child displayed. Children are starting to explore the world around them. They are starting to act out what they see in the real world and so our dramatic play area allows for children to explore real life experience. From the home corner to dolls, animals and real life foods our Discoverers love to play with the materials. Children of this age are exploring many things with their senses. It is important that they have the opportunity to touch and feel many different textures. Our messy play allows them to explore their senses with touch and feel in a safe environment. This area allows for an introduction into the use of building materials. Children learn about stacking, order and balance. Books are introduced at an early stage. This allows our Discoverers to explore literacy and language development. Children can explore the worlds around them and are introduced to different people, animals and objects from the environment in which they live. Through age appropriate puzzles, games and tools the children start to develop the fine motor skills they will need for future development. 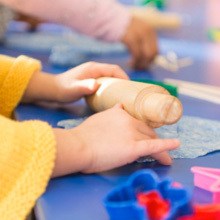 These open ended play experiences provide infants with opportunities to personally select, discover and handle objects in order to construct their own understanding. Gross Motor Steps: The steps allow our children to explore crawling and walking up and down a stepped area. The cross lateral development of using this piece of equipment is important to a children future development. Quiet Area: This is a soft play area for quiet play and chill out time. It is important that children have a quiet space protected from noisy play. Sleep Room :Our Discoverers have their own sleep area. This area is supervised at all times by an adult and is a relaxing area for rest and sleep. Children at this age are starting to develop language skills at a rapid rate. The dramatic play area allows children to use these language skills and test them within a safe environment. It also allows a child to work out real life scenarios and problem solve through play. Our dramatic play area changes throughout the year in order to allow our Explorers use their imagination in play. Sensory exploration and artistic play take place here. All materials are at a child’s level and the children are welcome to use the area as they wish at any time of the day. This area has an array of building and construction materials. Skills developed in this area are the basis for early maths. 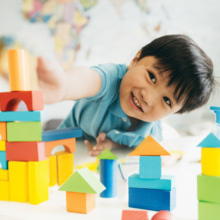 Children are encouraged to create, design, and problem solve through the use of building materials. The book area is filled with an abundance of reading materials to fill our Explorers with the love of reading and literacy. 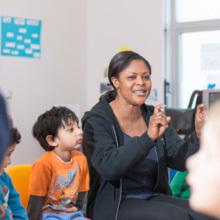 Through the use of stories we hope to build on language development. The quiet area is a protected space for children to rest or play alone. The small play area uses small replicas of the world around us. This area is used for play, sorting and classification. This is all important to your child’s development. 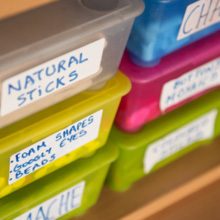 Materials are provided to build on the child’s fine motor skills. These materials include puzzles, games, and manipulation apparatus. Challenges our Explorers to further build upon their movement and motor skills. Climbing and stepping are still a key part of learning although over and under, pulling and crawling movements are introduced. The Explorers space and also the curriculum offered daily allows each child to reach their full potential. Planning is displayed weekly so that parents are aware of their child’s learning path. Our Active Cubs (age 3-6) operates as our pre-school classroom. We offer both sessional (ECCE year) and full time places in two creative environments. The emphasis of our learning is that children are given the building blocks to become active in their learning. This allows for school readiness and gives the children empowerment in their future learning. All key learning and new concepts are delivered within a circle time. Delivery of information and learning within a group opens up the floor for collaborative discussion. It allows our Active Cubs to ask questions and to problem solve with the guidance of their practitioners. It allows for the Active Cubs to push their development by asking “what if” questions and to innovate while developing. Our play space is divided into key areas of interest for the children to explore – see across. 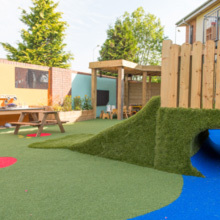 This area constantly evolves and changes to allow children explore the outside environment within a safe space. It will change from home, to shop, from school to restaurant. Children love to explore, act out and problem solve in this space. Like our Explorer Room, sensory exploration and artistic play take place here. All materials are at a child’s level and the children are welcome to use the area as they wish at any time of the day. The Active Cubs are now experts in the area of construction. In our Active Cubs Room we challenge our learners through the introduction of new materials and our favourite large blocks for further fun. An abundance of books allows us to explore social and emotional issues as well as to travel to far-flung places in our imaginations. This space allows for group stories as well as asking as a quiet space for children who wish to relax. Allows our cubs to play with the real and fictional world. Whether it’s the farm, the garage or the dinosaur world our children’s imagination comes to life in this area. Our little hands get ready for future development through handwriting, lace tying and bottle opening and pouring. It is in this space that we develop through fun activities. Puzzles, games, manipulation and practice helps to pave the way. We also explore the use of montessori equipment. Our important fine motor skills depend on our gross motor skills being developed and strong. Our program has a focus on outdoor play, inside movement breaks and active play. There is a constant focus on making sure that each child has strong building blocks for core body movement and so active play is part of the daily timetable. Our room has an area for music play. This allows a child to explore and be creative. Whether listening or creating there is lots of fun to be had. 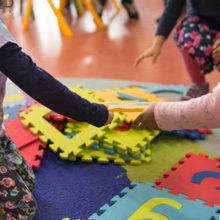 Our childcare rooms are designed into key areas of interest for child-lead exploration. Each room has a small motor area, dramatic play area, block play area, gross motor area, small play area, mess play area, art centre, book corner and quiet/chill out zone. Each area is designed to constantly challenge a child’s development and make learning fun. Our outside play area is also vitally important. We believe that there is no such thing as bad weather, just bad clothing and as such outside time is time- tabled daily. Our outdoor environment allows for a combination of dramatic play, gross motor development, sensory exploration and risk taking. Research has shown that children like to play in outdoor environments that look as if they built them themselves. Taking this into account, our garden is very different from your stereotypical child’s playground. It allows for a child’s holistic development. Many open-ended materials have been used to allow the child’s imagination shape and change the space. Breakfast Club runs from 7:30am until school begins, Monday to Friday during school term. Children will be provided with a nutritious breakfast before starting their school day. Breakfast will include cereals, toast and breads along with milk and breakfast juices. During the remaining time children will be free to play with their friends or use any of the equipment at Tigers. Organised activities will also be available for children although children can opt in and out of these activities. Children will attend Tigers from Monday to Friday from the time school ends until 6:30pm. These children will also attend during any in-service days or days upon which the school is closed (other than holidays, mid-term breaks, bank and public holidays). The rate for Full Time Care excludes Breakfast Club and camps. Hour Club is run for Junior and Senior infant children. Hour Club accommodates parent with children in older classes with one pick up time. The Homework Club is run for school going children in first class and above attending Tigers from Monday to Thursday. The programme runs from 2:40pm – 3:40pm and provides children with an hour of tutored homework time. All homework is checked by the supervisor and ticked and initialled in the child’s homework journal when completed. Each night parents should check that homework is satisfactorily completed and sign their child’s homework journal. All reading homework is done at home. Care is provided during in-service days (not mid-term breaks). On these days Tigers operates from 7:30am until 6:00pm. In- service day care may be offered in an centre other than the one your child usually attends e.g. if a school is being used as a polling station we will accommodate your child in another nearby location. You will be given advance notice of this. In-service day care is not included in your monthly fee and a €20 fee must be paid if your child is to attend on an in-service day. Camps are held during mid-term breaks (excluding Christmas holidays), for two weeks of the Easter Holidays and for 6 weeks during the summer. Camps are usually held in one location and not in each individual centre. To enroll your child in any of our camps you are required to complete a registration form and pay a non-refundable deposit. The Early Years, Pre-School and After School Quality Environments are created to individually suit each age group. At Tigers Childcare we are dedicated to every child having outdoor play and activity on a daily basis. We are of the attitude that there is no such thing as bad weather just bad clothing. All children under 12 months are taken for a daily buggy walk. Children over 12 months play in our outdoor areas at least twice a day. It is important that all our children are physically active, not just from a health point of view but also for their important motor development. At Tigers Childcare we are dedicated to every child having outdoor play and activity on a daily basis. At Tigers Early Years Centre we believe that child and adult interactions play a key part in a child’s social and emotional development. Children need to be able to build strong attachments to the adults in their lives and as such we ensure a low turn over of staff. All Tigers staff are fully qualified in childcare and Garda vetted. Our minimum qualification requirement is FETAC level five with many of staff trained to FETAC level 6 and also degree level. Our staff files and references are available for parents viewing. We believe that in order for our staff to develop within a constantly evolving industry, we must invest in training and development. All staff are trained in first aid and child protection. We also encourage and fund staff attendance at any training events delivered by the County Childcare Committees and Early Childhood Ireland. Our centres are audited by our Regional Manager on a bi-monthly basis. We also carry out an annual ITERS and ECERS audit. These audits look to access our environments and interactions against world standards using the Early Childhood Environment Rating Scale. At Tigers Early Years Centre we believe that child and adult interactions play a key part in a child’s social and emotional development. We foster the belief that parents are the primary educators of their children and thus we have an open door policy in our pre-school and early years centres. We have a parent school day rota which affords each parent the opportunity to attend school with their child during the year. We foster the belief that parents are the primary educators of their children and thus we have an open door policy in our pre-school and early years centres. We use a online application called Child Paths to allow for more effective communication between our services and parents. Child Paths allows parents to be involved in their child’s day by allowing them to access information on their child and, in turn, build up a greater knowledge of their child’s interests, skills and capabilities. Child Paths also reduces the amount of paperwork the childcare staff have to complete, allowing them to focus instead on their interactions with the children, rather than documentation. (childpaths.ie). We use a online application called Child Paths to allow for more effective communication between our services and parents. We believe it is important for children to lead in their learning. The curricula changes based on the children’s needs. The early years of a child’s life are critically important for the formation of good lifestyle habits, including a positive attitude towards healthy eating. At Tigers Childcare, we promote and encourage healthy eating. Healthy eating habits started in childhood will stay with your child forever. Children grow and develop fast, so they need a high quality, varied diet, with a good balance of energy, protein, vitamins and fibre. Healthy eating is about having a varied balanced diet and enjoying lots of different food. Tigers Childcare provides staff with an ideal opportunity to positively influence children’s eating habits through healthy role-modelling and helping children learn about healthy food and drink choices in a safe, supportive environment. Staff also have many opportunities to promote, inform and guide parents to make healthy food choices for their children and families. We provide food at specific times during the day, however we realise at times children can be hungry and thirsty outside of our regular eating times. Children will be provided with food and drinks at any time when requested and fruit will be provided if a child is hungry in-between meals. Our hot meals are provided by Moon and Spoon who specialise in catering for children of all ages. They work closely with a consultant dietician to ensure that all of their dishes provide optimum nutrition. Using a mix of fun names, aromas, textures and flavours the food appeals specifically to children’s senses. Because the menu is entirely balanced, it helps children develop excellent dietary habits from a very early age. You can find out more about Moon and Spoon on their website – www.moondandspoon.com. These meals are precooked for us and heated in our kitchen. All HACCAP food standards in reheating food are maintained daily in our kitchen. Moon and Spoon provide for allergies and dietary requirements. Please let us know if your child has any additional needs. Weekly menus are displayed and a list of allergens is available in each Tigers Childcare location. The early years of a child’s life are critically important for the formation of good lifestyle habits, including a positive attitude towards healthy eating. Children from the age of 1-2 are constantly discovering the world around them. Development is taking place rapidly on a daily basis. The Discoverer’s Room is designed to meet the needs of a child at this stage of development. We understand that all children are developing at different paces and so our practitioners are on hand to observe each child’s progress and track their future learning path. We believe that our babies need extra attention and so our policy is to over staff our baby rooms allowing for extra care and attention during their care routines. We believe that our babies need extra attention and so our policy is to over staff our baby rooms allowing for extra care and attention during their care routines. Our babies need outside time too. We try to create an environment as close to home life as possible. Just like at home our babies are taken for walks daily to enjoy fresh air and explore the environment around the crèche service. We understand the importance of not just the child’s immediate environment but also the community environment in which they live. Children learn from real experiences and so we invite community representatives into our services to enhance the children’s learning. The dentist, the Garda, the doctor, the fireman, the shopkeeper and many more are welcomed to bring real life learning to life. The transition from crèche to primary education can be a challenge for parents and children. We believe that it is our responsibility to help ease this transition. We invite the local principals into our service to familiarise them with our children. With parents permission we pass over a report card allowing the new teacher to learn about our children – their likes and dislikes and their individual approach to learning. Coming close to the time of leaving us we practice the practicalities of school life. We introduce the school routine and uniforms from our local schools to our dramatic play corner so that school life becomes more familiar. We believe in the strength of community and encourage our open door policy with all parents. We view parents as the primary educators of their children. They know their children best. It is with this view that we treat parents very much as partners in our service. We look for constant feedback from parents with regard to their experience with their child. Parents are given daily updates along with monthly learning stories. These stories allow for parents to add their thoughts to their child’s storybook. We hold parent evenings, parent breakfasts and training for parents throughout the year. Each parent is also invited to a “bring your parent to crèche day” to allow them watch a day in their child’s life. This also allows a parent the opportunity to share their own experience and culture with the crèche community.